The most natural looking brows imaginable! Brow Microblading Layton and Park City based Surface Medical Spas offers is at the cutting edge of technology is semi permanent makeup techniques. It is done using a very fine blade to deposit pigments into the epidermis to create the appearance of individual hair strokes. In impacting color closer to the surface, the strokes appear crisp and very fine. The results of our Microblading are the most natural looking eyebrows imaginable. Each stroke creates the appearance of an individual hair, regardless of the amount of hair present. People suffering from alopecia, trichotillomania or any other condition that causes hair loss benefit greatly from Microblading, restoring hair that has been lost. 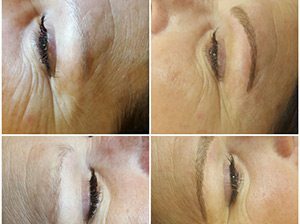 The semi permanent makeup pigments used by our doctors in Layton and Park City for Brow Microblading have been formulated to match your original eyebrow color, and if the eyebrows are still present, blend perfectly into them. The results are a natural, flawless, fuller looking brow. Initially, the brows appear darker, but will fade over a two-week period, which makes your touch up appointment essential. The results generally last from 1 to 3 years. However, once yearly touch up is recommended to retain the shape and saturation of the semi permanent makeup pigment. 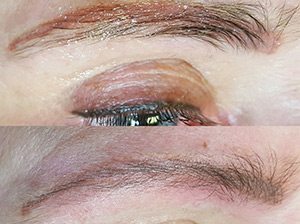 We begin your eyebrow Microblading appointment in Layton or Park City with color matching. Your desired brow shape is then created using your face shape, hair growth and bone structure to place your brow. Together we will work to create your perfect eyebrows. Topical numbing is used to reduce any discomfort that comes with this procedure. The locations in Park City and Layton's Microblading process takes 60 to 90 minutes, but can take up to 3 hours depending on skin type, correction of shape, and symmetry. The art of eyebrow semi permanent makeup is a process, the follow-up appointment is necessary to perfect your brows after initial treatment. *Disclaimer: Individual results vary. Images do not constitute a promise or representation of any particular outcome or experience.